In contrast to car repair shops in West Europe and North Ameri­ca, in Sierra Leonean garages vehicles are predominantly repaired, and only occasionally are damaged car parts replaced by spare parts. We are dealing here with work and repair practices that are – unlike operating procedures in West European and North American workshops – rarely standardized, but rather dynamic and creative, since they are practically oriented and situational. This in turn leads to knowledge neither being acquired and transferred through merely theoretical explanations nor via educational textbooks. 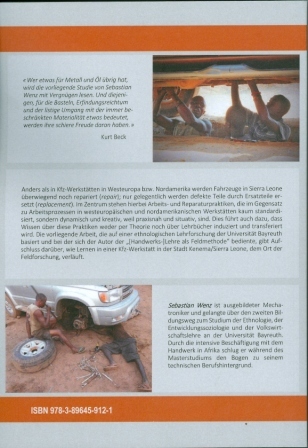 The present work, which is based on a field research training organized by the Facheinheit Ethnologie of the University of Bayreuth and draws on the approach of apprenticeship as a method of anthro­pological research, sheds light on the processes of learning in a vehicle repair shop in the city of Kene­ma, Sierra Leone. In this regard, it can be considered as an innovative contribution to the study of the automotive profession in Africa. Although, admittedly, several works have been published on this topic, these studies – for the most part – date back to a point in time at which the pedagogical concepts the author makes recourse to in the present book were yet to be conceived. 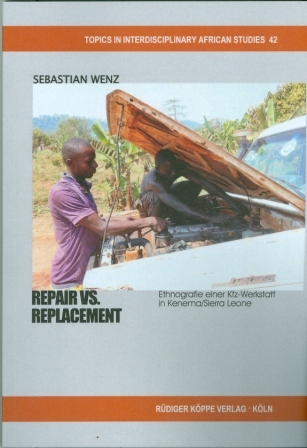 The first chapter gives an overview of the framework of the research, of the infrastructural and geo­graphical conditions in Kenema, as well as of the context of vehicle usage under these conditions. The second chapter is dedicated to the work practices of modification, conversion, or repair as such and contrasts repair with replacement by means of the social practice approach. Chapter III takes into account how the regional circumstances impact on the repairs proper on the one hand (e.g. on their quality), and on the social fabric of the workshop on the other. Finally, chapter IV is concerned with the acquisition and transfer of knowhow – including the social norms and values to adhere to in a garage – within the framework of an apprenticeship in the absence of institutions of formal education.